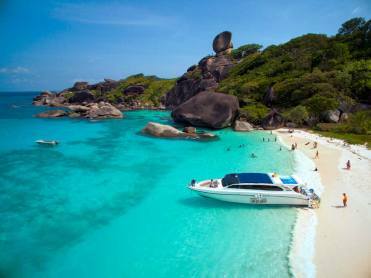 The Similan Islands, Thai pronunciation: [mùː kɔ̀ʔ si.mi.lan], Malay: Pulau Sembilan) is a group of islands in the Andaman Sea off the coast of, and part of, Phang Nga Province, southern Thailand. It is a national park, Mu Ko Similan, which was established in 1982 after a one-year assessment by the forestry department. Access to the Similan Islands is easiest from Tab Lamu Port, just south of Khao Lak in Phang Nga Province. The park headquarters is in Tab Lamu, which is a small fishing village, just 13 km from Bang La On in Khao Lak. Boats depart daily from the middle of October to the middle of May. The trip takes about three hours each way on slower boats or 70 minutes via speedboat.